Rudy Giuliani maintains that Barack Obama doesn’t love the United States of America because of the way he was brought up. Obama was largely brought up after age 10 by his grandmother and grandfather on his mother’s side, Madelynn Dunham and Stanley Armour Dunham. Stanley Dunham enlisted in the U.S. Army in January of 1942. His unit, the 1830th Ordnance Supply and Maintenance Company, Aviation, supported the 9th Air Force during the Allied landing at Normandy Beach in France on D-Day. Stanley and his unit were sent to France 6 weeks later, as was his brother. As for his wife Madelyn, she made the sacrifice during the war of working the night shift in Wichita, Kansas, at a factory making the Boeing B-29. Barack’s maternal uncle, Charlie Payne (Madelyn’s brother) served in the 89th Infantry Division. That division liberated one of the Buchenwald death camp complexes, Ohrdruf. Somehow I feel that the Dunhams loved America and raised their grandson that way. And it seems pretty clear that by referring to how Obama was brought up, Giuliani has just spit on the graves of the Dunham family. In contrast, Rudy Giuliani never served in the US military and nor did his father (his grandparents immigrated from Italy). As for how he was brought up (and this isn’t his fault), his father Harold served time in Sing Sing for robbery and then was a soldier in an organized crime operation in Brooklyn that ran a gambling racket and did loan sharking. I don’t know, maybe Harold raised Mr. Giuliani to love the country that offered him the opportunity to break people’s legs for not paying their vig. And here you have to wonder if Giuliani’s bizarre trashing of Obama is a form of projection, if it is Rudy Giuliani who wasn’t raised to love his grandparents’ adopted country. Obama and Giuliani are both from relatively recent immigrant backgrounds, but no one asked to see Giuliani’s birth certificate. In fact there is an interesting reversal going on here, since Obama’s father came as a student and was from a rising family in the old country. Barack Hussein Obama, Sr. earned an MA in economics from Harvard. He rose to become senior economist for the Kenyan Ministry of Finance. Obama’s mother was from a Midwestern middle class family of old standing (it goes back to a signatory of the Magna Carta in England). Obama’s antecedents were respectable ones and both of his parents had higher degrees. In the racist American system, though, he faced the challenge of low African-American social status. Giuliani’s parents in contrast were children of Italian workers from the Tuscany region, who struggled to survive in the American urban jungle and cut some corners. 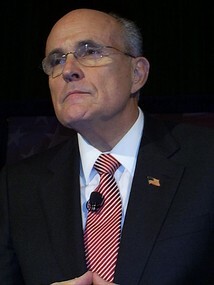 Giuliani growing up also faced status issues in being Roman Catholic in a country with a Protestant establishment. Both Obama and Giuliani overcame the challenges that their immigrant background presented to them, rising to high office despite not being WASPS. Both served the country to which their forebears came with high distinction. Giuliani as prosecutor helped clean up New York, though he later appointed corrupt officials once he became mayor. But his methods were unconstitutional, and involved constant pat-downs of minorities. Precisely because he was an outsider to the New York elite, Giuliani needed someone to look down on, someone on whom to blame crime, and for him it was the minorities (though his grandparents would have been viewed as minorities themselves on arrival here). Giuliani should stop and consider that love for America is not just a statement of the sort, he says, Reagan and Clinton made. It is also honoring the central document of Americanness, the Constitution and its Bill of Rights. Giuliani is contemptuous of the fourth and eighth amendments and demonstrated it practically in the way he ran New York City. That Obama is president and Giuliani is not clearly sticks in the latter’s craw. It is shameful that he should question Obama’s love of country. But surely he is just compensating in public for his own family’s shady background and his own mistakes such as violating the guarantee against unreasonable search, and promoting crooks such as Bernie Kerik. He should realize that he can’t convince people he loves America, after all his undermining of the US constitution, by denigrating the patriotism of the president of the United States.